We Carry Only Pro Quality Asian Lady Beetle Sprays, Dusts and Pesticides. No License Required* and Super Fast FREE Shipping! GUARANTEED LOWEST PRICES! - Anywhere On The Internet! Lady bugs surrounding and invading your home by the thousands? millions? It's not lady bugs, it probably the Multi-Colored Asian Lady beetle. The Multi-colored Asian lady beetle (Harmonia axyridis) are sometimes mistaken for ladybugs or lady bird beetles, and are familiar insects in many parts of the United States. For the most part, Asian lady beetles are beneficial predators that eat aphids, scale, insects, and many other pests that injure plants in gardens, landscapes and agricultural settings. However, in many places of the midwest and eastern USA, the Multi-colored Asian lady beetle has become a household pest. This beetle feeds on aphids and other soft-bodied insects that dwell on crops and trees. Soybean crops can host a lot of different insects and food sources that are an important food source of Asian lady beetles. When the soybean crops get harvested in late summer/early fall, watch out! Asian beetles will be migrating away from those fields in the millions and could become a major nuisance in and around your home! The multi-colored Asian lady beetle was first recorded as a pest in houses in 1988 in Abita Springs, Louisiana. It was originally released as a biological control agent in the late 1970's and early 1980's in Pennsylvania for certain crops, including cotton. Because the beetle was not recovered after these releases, it was assumed that it had not established and was incompatible with North American conditions. The source of the 1988 infestation in Abita Springs, LA is not thought to be from the USDA releases, but rather from an Asian Freighter that was offloading freight in New Orleans. The original infestation site was close to ports used for international shipping including cargo containers from Asia. Since this accidental release in New Orleans, and the USDA controlled releases, the beetle has rapidly expanded its range and is now commonly found throughout much of the midwestern and eastern United States. Large congregations tend to be found on windows, doors, and porch decks, and in the walls, ceilings and attics of homes and buildings. In the fall, once the weather starts to turn colder, Asian lady Beetle adults begin to seek over-wintering sites. 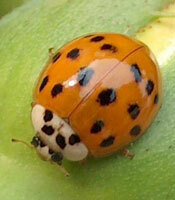 Asian lady beetles appear to orient toward light colored, conspicuous objects, such as white buildings. Large numbers collect on outside walls warmed by the sun, especially on the south and southwest sides. When one lady beetle lands, many others soon follow. Some research suggests that this aggregation behavior may involve chemical cues (pheromones), visual cues, or a combination of all. 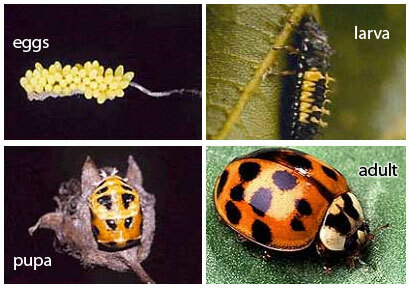 The life cycle of the Multi-colored Asian lady beetle is 3-4 weeks. The completion of the life cycle is totally dependent on natural food sources, temperature, rain, etc. There are multiple generations of these beetles per year. Multi-colored Asian lady beetles go through an incomplete metmorphosis, similar to a fly or a butterfly - Egg, larvae, pupae and adult. Eggs are small, yellowish and oval in appearance. They are laid in small clusters of about 20 eggs. They are laid on the underside of leaves of trees and crops including tobacca and soybean plants. The eggs hatch in as little as 3 days. Larvae are approximately 4mm long and 2mm wide and are a dark charcoal to black color. The larvae stage usually lasts up to 2 weeks, during which they feed primarily on aphids and scale insects. Pupae are approximately 7mm long and 6mm wide, flattened and oval. They are orange to yellowish with lines of dark spots that originate from the head area ending into a tuft of hairs called tubercles or spines on the rear end. The pupae stage can last 1- 2 weeks, and then depending on environmental conditions, the adult beetles emerge. Adults are approximately 3/8" long and 3/8" wide. They are slighter larger than our native lady beetles and also tend to be a darker orange to blackish orange with as many as 19 dark spots. The number of spots and the darker orange appearance are the primary differentiating factors between the Asian lady beetle and the native lady beetles. Adult Multi-colored Asian lady beetles can live up to one year. Multi-colored Asian lady beetles are slightly larger than most native lady beetles, with adults measuring 3/8" long 3/8" wide. They are oval or convex in shape, and yellow to red in color (without black spots on wing covers). The beetles spots, which can vary in size and pattern, number from no spots to as many as nineteen; however, nineteen is the most common number. The head is usually concealed beneath the disk-shaped pronotum, which is cream to yellow in color with a black 'M' design in the center. Asian lady beetle larvae are elongated, flattened, and covered with minute tubercles or spines. They are often described as alligator-shaped. The eggs, which are laid upright in clusters of about twenty, are oval and yellow. Common lady beetles are different than their cousin, the Asian lady beetle, due primarily to the number of spots on their back and also their aggressive nature. Common Lady beetles have 4-6 spots on their back and are a light - medium orange color. They are very passive and not aggressive by nature. They are important beneficial insects that feed on a multitude of plant pests. Asian lady beetles by contrast, have multiple spots on their back (as many as 16 - 19) are a darker burnt orange and are very aggressive. When handled, reports of Asian lady beetles actually biting humans has been reported which makes their control that much more important. Instead of being a passive beneficial pest, Asian lady beetles are quite the opposite. Handle Asian lady beetles with extreme caution! The Asian Lady Beetle is a voracious predator of aphids and scale on trees, shrubs, and crops. Adults are capable of consuming 90 to 270 aphids per day and larvae can consume between 600 and 1,200 aphids during its life stage. Both adults and larvae have been observed in soybean fields feeding on the newly introduced soybean aphid and are believed to be effective biological control agents in controlling this important pest. The greatest damagecaused by the multi-colored Asian lady beetle is the discomfort they give to homeowners. It is not uncommon for tens of thousands of beetles to congregate in attics, ceilings and wall voids. When the heating is turned on, the beetles tend to move around inside these voids and exit into the living areas of the home. In addition to biting, they exude a foul-smelling, yellow defensive chemical, which will sometimes cause spotting on walls and other surfaces. Most people are only annoyed by the odor of these chemicals. However, some individuals experience an allergic reaction to their excretions. Sinus irritations and skin irritations have been reported subsequent to encounters with the Asian lady beetle. It is probably not an over-reaction to wash hands or other skin after contacting the beetles. In at least one study, the severity of sinus problems subsided with the removal of beetles from the home. Spraying indoors without spraying outdoors is virtually useless. Asian lady beetles have to be controlled outdoors first. This is done by spraying the outer walls, trees, shrubs and anywhere Asian beetles are found. Killing as many beetles as possible outdoors will help with controlling them indoors. Outdoors use Onslaught Fastcap, Talstar, Bifen or Demon WP to kill Asian Lady Beetles. Treating outdoor areas is very time consuming and getting the appropriate coverage over the area can be a real challenge. But it's the only way to stop the invasion. The use of a backpack sprayer or a mister gives much faster and broader applications. We recommend the Solo Backpack Sprayer or the Solo Backpack Mister for applying outdoor pesticides. The Solo Backpack Mister blows a mist of pesticide up to 40 feet away. You can mist the tops of trees and even mist the entire outdoor walls of your home or building in just a matter of minutes. This is especially important since repeat treatments may be needed every few days or weeks during a heavy Asian lady beetle siege. 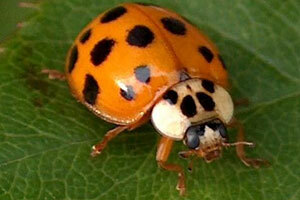 Controlling Asian lady beetles indoors is virtually impossible unless you treat outdoor first. After you have treated outdoors and killed as many beetles as possible, indoor treatment can begin. Use Onslaught Fastcap, Demand CS, Demon WP or Alpine Pressurized Spray and spray all baseboards, window sills, doorsills, and other areas where Asian lady beetles persist. A direct spray on the beetles provides the best results. Onslaught FastCap gives the best control, as it kills on contact and provides a lasting residual. 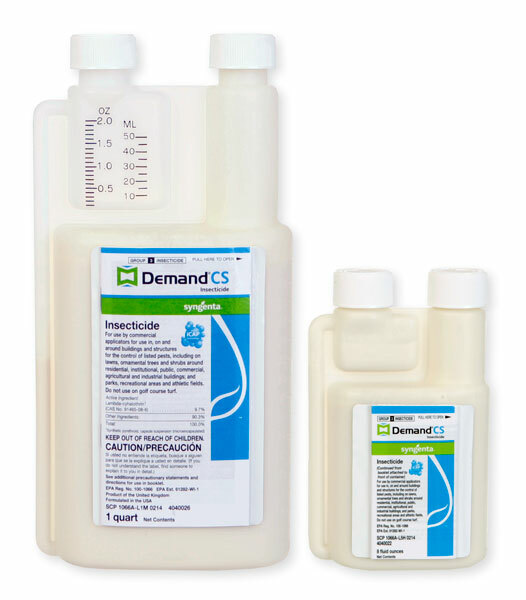 Demand CS provides a long residual since it is microencapulated and Demon WP provides a much quicker kill. Use a good quality sprayer such as the Ortho Heavy Duty Sprayer to provide a uniform spray pattern. Be sure to read and follow label directions on any pesticide that you use. Precor 2625 Premise Spray is an aerosol that is labeled for use indoors against Asian lady beetles. It comes in a convenient "upside down" spray can. Simply spray all floors, baseboards, window sills - even furniture if needed. Precor 2625 Premise Spray is a low odor product, dries quickly and does not leave any sticky visible residue. 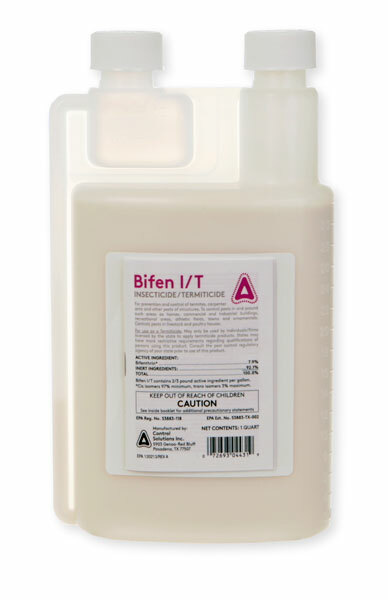 It also contains a growth regulator that helps to prevent all insects from completing their life cycle. It's an excellent all around indoor product for a variety of pests. CB80 is a pyrethrum based aerosol handheld fogger that quickly kills large numbers of Asian beetles indoors. Simply aim the CB80 can at the ceiling of every room, push the button and fog the room for 3-5 seconds (average size room) and then close the door and leave for 2 hours. CB80 also works best when the fog is directed to the beetles such as corners of rooms, etc. Pest proofing or sealing the outside cracks with Stuffit Copper Wool may help to prevent Asian lady beetles from getting inside. This can be done by sealing all outside cracks and crevices around doors, windows, siding, utility pipes and other openings. A quality silicone or silicone-latex caulk can also be used for small cracks. Window screens should not have any tears and should fit snugly inside the window frame. Install insect screening over attic and exhaust vents. Take measures to exclude Asian lady beetles before late autumn when they begin to seek over-wintering sites - potentially in your home! If numerous lady beetles are entering the living areas of the home it is advisable to locate the places where the beetles gain access and seal them thoroughly. Typically, Asian lady beetles will emerge from cracks under or behind baseboards, around window and door trim, and around exhaust fans or lights in ceilings. Seal these openings with caulk or other suitable materials to prevent the beetles from crawling out. A temporary solution is to use duct tape or masking tape to stop the beetles. A helpful hint to remember - the beetles are attracted to light and can see light entering through cracks in the walls or ceilings. Initially, concentrate on sealing cracks in the rooms where Asian lady beetles are most prevalent. Vacuuming with a vacuum designed to capture pests such as the Atrix Bug Sucker may also help to collect beetles in your home. The major complaint for this method is that the beetles become agitated and expel the yellow, foul-smelling repellent, which is then circulated into the air by the vacuum exhaust. Also, it is advisable to empty the bag and beetles after each vacuuming to prevent them from escaping back into the house. Freezing the bag for at least 3 hours will kill the beetles, also submersing the bag in soapy water, or an insecticidal mix will kill them. Using traditional vacuums, it is possible to capture the beetles inside a knee-high nylon stocking that has been inserted into the extension hose or wand and secured in place with a rubber band. As soon as the vacuum cleaner is turned off, be sure to remove the stocking so that the captured beetles cannot escape. As you remove it, the rubber band closes around the stocking, effectively "bagging" the lady beetles. You then can discard the contents of the stocking. This way you will not need to change the bag every time you vacuum every time. Light Traps or insect "zappers" such as the Genus Spectra Compact may provide relief from beetles flying or crawling around the exterior of homes with its light source. Asian Lady Beetles will be attracted to the trap and be "zapped". DO NOT use this type of light trap indoors. Light traps are most effective at night when there are no competing light sources. The tray may need to be emptied on a regular basis as the dead beetles pile up. Do not place this type of trap in the open. It needs to be protected by an awning, eave or other weatherized covering to protect it from rain. Insect traps and glue boards can also be used to trap Asian lady beetles. Don't depend on them for complete control. Like all traps, they are not designed to rid the structure of pests, but only to monitor the infestation levels and provide some relief. Catchmaster 288i are small glue traps that can be placed under lights on window ledges and other places to capture Asian lady beetles. Once the Catchmaster 288i is full, simply toss it in the trash and replace. Keep plenty handy, especially if the Asian lady beetle population is very large. Catchmaster 288i also work well to capture cockroaches, crickets, flies, geckos, lizards and many other insect pests.